Notifications are the heart and soul of the Action Center in Windows 10, from the first version to the latest. but receiving a barrage of notifications isn’t always welcome. That’s especially true if you have multiple apps pushing out notifications every time anything happens. The good news is you can easily turn notifications on and off in Windows 10 Settings, so long as you’ve already received a notification from it. Here’s a quick rundown on how to disable notifications for any installed app, as well as how to control the types of notifications you see. Want to turn off notifications from your browser? Here’s how to do it. Step 1: Open the Windows Settings menu by pressing the Windows Key and I or alternatively search for Settings in the Windows search bar and click the corresponding result. Turn them off as you need. If you don’t want any, just make sure they are all toggled off. You’ll need to install the particular app you want to view notifications for if it’s not already built into your system, and you can receive a notification first before an app will show up in the list. If you want to hide notifications without turning them off entirely, you can always temporarily mute them using Focus Assist. Step 2: Click on the moon icon, to enable Focus Assist. This will hide all notifications by default between the hours of midnight and 6 a.m. Step 3: You can further customize by right-clicking on the moon icon and going to Settings. This will let you change times and priority levels for when you do and don’t want notifications enabled, be it during a more specific time or even when you’re playing a game. Notifications are a phenomenal tool for keeping up with the hustle and bustle of our digital lives. However, an excess of notifications — especially ones you’ve previously seen — can clutter the Action Center and prevent you from seeing important notifications as they arrive. 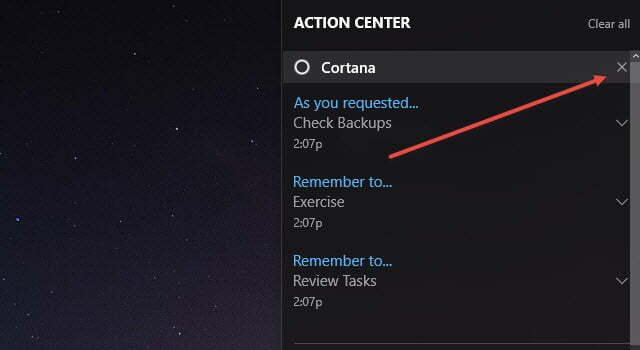 To dismiss individual notifications, click the Action Center icon located on the right-hand side of the Windows taskbar and mouse over the notification that you’d like to dismiss. Then, click the X button directly to the right of the notification. You can also swipe a notification to the right to dismiss it quickly with either touch or by clicking and dragging with the mouse. You can dismiss all of the notifications for a given app by clicking on the X button to the right of the app group listing. You can also click Clear all to close every notification for all apps. Note: In the spirit of being better connected, Windows 10 notifications will dismiss on other Windows devices when you dismiss them in the Action Center on your desktop. In Windows 10, you can choose to view or hear a combination of banner notifications, which comprise a pop-up in the lower-right corner of your display and sounds. You can also configure various apps to only show notifications within the Action Center, with no other indication on arrival. A number of notification options are available for each app that supports them.